On left, Taylor Jones, MIB, by Ideal, 1976. This doll has a rotating scalp, which allows one to change the doll's hair color from black to auburn. This doll is one of the most beautiful dolls produced in the 1970s. 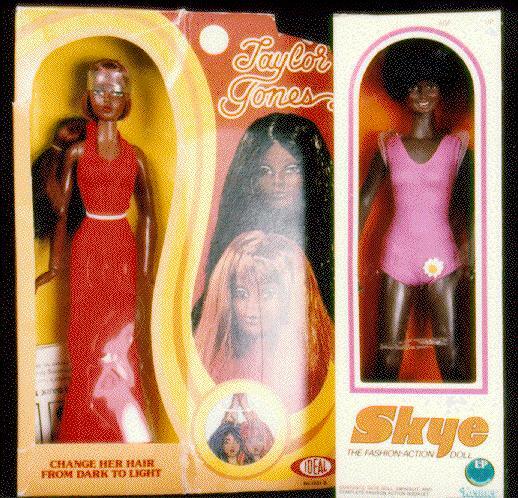 On right is Skye, the fashion/action doll by Kenner, 1975. As Skye is one of my all time favorites, I had to include a picture of her MIB. She was made by Kenner in about 1975, and advertised as "the fashion action doll", along with her freind Dusty. This basic doll was sold in a bathing suit. Because Dusty and Skye's construction is: vinyl legs/arms, and hard plastic torso, I have found it VERY common that dolls are found with limbs "glued" into one place. I have had good luck prying these limbs loose, if you gently and patiently move them back and forth.